What’s the best alternative to backpack blowers? Just ask Rental Magazine. Last year, they gave the Editor’s Choice Award to the Little Wonder Optimax blower. Why? It has a patented impeller design that delivers far more power than backpack models while avoiding many of the design pitfalls of competing walk-behind blowers. The Optimax uses Little Wonder’s patented scroll housing and reverse angle blade steel impeller. This gives it superior performance and lower cost compared to plastic housing blowers without the dead spaces, vibration, and noise of other metal housing designs. Since they use large four-stroke engines, they’re able to deliver enough power to do as much work as four backpack blowers. 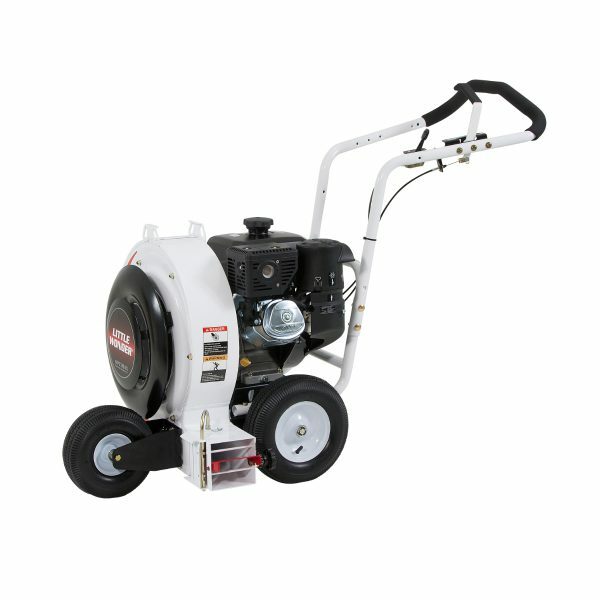 That power lets professional landscapers and groundskeepers cut job times and labor costs by using one of these machines, while reduced fatigue and easier starting makes the Optimax a great choice for residential owners and renters. The Optimax uses a square air discharge that sits just two inches off the ground. This creates an air stream that skims the surface of the ground to move the maximum amount of leaves and debris. While there are competing blowers with more power, the air from their high-mounted round outlets doesn’t have the reach of the Optimax, requiring more passes to clean large areas. The opening of this discharge has a split-stream air deflector, separating airflow into two unique channels. It can be used to deliver high-pressure air along the surface to dislodge wet leaves and low pressure to push the leaves into a pile, or it can be raised to move tall piles of loose leaves without blowing them upward. The nozzle can be angled without using tools, going from side discharge for maximum distance to front discharge to remove leaves and debris next to buildings with minimal blow back. Do you have a favorite small engine manufacturer? The Optimax is offered with engines from Honda, Subaru, Kohler and Briggs & Stratton Vanguard, so there’s a model to fit your preferences. This range of powerplants also lets you pick a model that has high airflow to move massive quantities of debris, high speeds for lifting heavy material, or a little of both for all-purpose use. These models add a single speed transmission with a maximum speed of 4.1 mph going forward and 2.5 mph in reverse. This doesn’t just make it easier to use, it also increases the speed operators can clear areas of debris. The parking brake uses a metal bar to stop the movement of both rear wheels, letting you park the blower on slopes. It can be added to any push blower. The tool holder bolts to the side of the handle, providing a place to carry a shovel, broom or anything else you may need when using your blower. Do you mostly use your blower on paved surfaces? The front pneumatic tire can be replaced with a solid tire that is more abrasion resistant. Little Wonder backs the Optimax with a 5-year warranty. Honda, Vanguard, and Kohler warranty their engines for three years, while Subaru warranties their engines for 5 years. Shank’s Lawn Equipment is a dealer for Little Wonder and every engine manufacturer they partner with, so we’re able to fully support these blowers. We can repair your blower, install accessories and provide you with the OEM parts you need to do your own repairs. Visit us at 4900 Molly Pitcher Highway in Chambersburg, PA, just south of Marion. Not in the area? We ship parts and accessories across the U.S. and Canada. To order from us, visit www.shankslawn.com. This entry was posted in Uncategorized and tagged Little Wonder Optimax Blower, Optimax Blower, Shank's Lawn. Bookmark the permalink.